The sandwich was awesome! 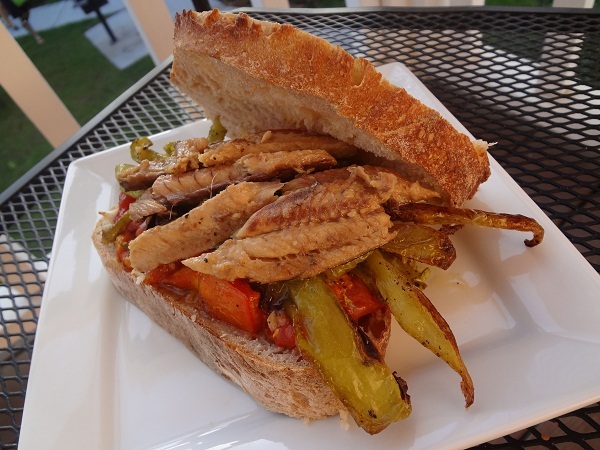 I loved the hearty and healthy bread, the juicy tomatoes, slightly salty sardines, crunchy garlic, and roasted cubanelle peppers. I can’t wait to enjoy the leftovers for lunch tomorrow. Preheat oven to 350°F. Wash and dry cubanelle peppers and tomato. Cut tops off cubanelle peppers and cut in half length-wise. Remove seeds and then cut each half into strips. Place cubanelle pepper strips in a baking dish. 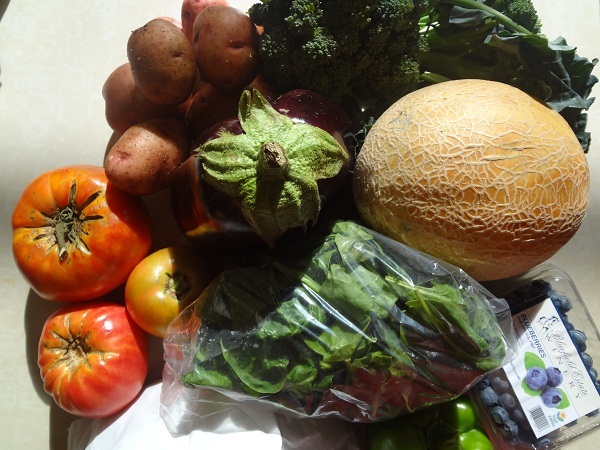 Chop tomatoes and place on a separate baking sheet. Drizzle contents of both trays with extra virgin olive oil and sprinkle with sea salt and freshly ground pepper. Peel garlic and mince. Divide among both trays. Mix the cubanelle peppers to evenly coat. To the tomatoes, add fresh basil leaves and vinegar. Mix the tomatoes. Bake each tray for 50 minutes or until cubanelle peppers and tomatoes are lightly brown. Drain tomatoes. Pour contents of sardine can onto a small baking dish and heat in oven for 5 minutes or until warm. 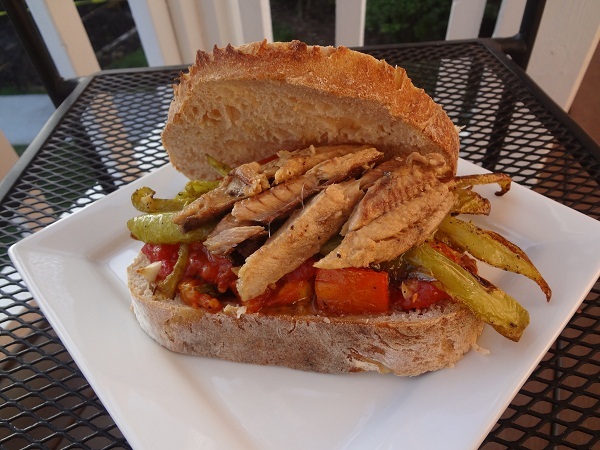 Layer drained tomatoes, cubanelle peppers, and sardines on slice of bread and place other slice on top. Enjoy! Nutrition note: Slice and freeze fresh bread to make it last a lot longer. (It’s difficult to slice once it’s frozen.) Do not refrigerate bread; this will actually increase the staling process. Jamie says: These past four weeks have been busy. In a month, I have… graduated; moved home; applied for jobs; traveled back to Gainesville/Jacksonville for a wedding; gone on a cruise with my girls from freshman year dorm life; studied for, taken, and passed the RD exam; and applied for state licensure. Whew! Cut bread piece in thirds horizontally (instead of in half). Divide arugula among bread slices. Chop onion slice and place on top of arugula. Top with sardines and sauce. Use extra sauce for dipping. Flavorful! The sardines in tomato sauce are one of my favorite ways to eat sardines. The hunk of artisan bread is a great vehicle to serve the sardines on. Nutrition note: Sardines are loaded with heart-healthy omega-3s and calcium. 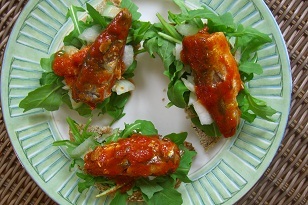 The Sardine Arugula Sandwiches have 2,800 mg omega-3s and 40% of the Daily Value of calcium.